Known as the World's Luckiest Fishing Village, the fruitful waters of Destin Florida offer fishing of all kinds for any budget! Our Destin Fishing Charters offer everything from full day, deep sea charter boat trips on the Gulf of Mexico to professionally guided half day fishing excursions on the backwaters of the Choctawhatchee Bay. BOOKING TRIPS FOR 2019 ! Mid March and the Cobia have arrived! Ling Ling! Tight Lines! Fishing for everything from Red Snapper to Blue Marlin! Accommodations for up to 16 people on an air conditioned boat! We book Private charters, Corporate fishing trips, Destin Deep sea fishing and trolling. Lets go fishing! 4 to 36 hour fishing trips. Small groups and large groups up to 16 anglers. Seahorse is equipped with all the latest technology to put you on the fish. Fishing for All Species. Fish for any species in the Gulf of Mexico! 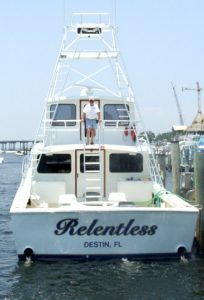 The Relentless provides Destin fishing charters all year long. Custom designed boat built for comfort and performance. We do it All, from Crab Island to the Flemish Cap! No Alibi Fishing Charter offers affordable deep sea fishing charter rates for single & group fishing trips from 4 to 72 hour overnight fishing adventures. Specializing in All bottom and offshore fish! Cobia and Destin shark fishing charters are also available today! Located conveniently in the Destin Harbor! From Gulf Red Snapper to Sailfish and Blue Marlin, Bow'd Up has you covered! All fishing gear provided for a One-on-One Destin Fishing experience. Super Stable boat fishing with high quality fishing equipment! We also offer Spearfishing and oil rig trips too! Into the Blue offers half day, full day and overnight Destin deep sea fishing. Trolling and Bottom fishing for all of our local species. Also, Cobia fishing in the Spring months! Fishing for everything from Red Snapper to Mahi to Blue Marlin! Want to get to the fishing hole wish comfort and SPEED? Here' the fishing experience for You! Accommodations for up to 6 anglers on each Yellowfin boat ! We book Private charters, Corporate fishing trips, Destin Deep sea fishing and trolling with inshore trips on the 24 footer. Note: Our Destin Fishing Charters provide everything you need to fish with such as licenses, equipment, tackle, bait, ice & fish cleaning. The customer typically supplies food, drinks & fish cooler but can likely be provided at additional costs, if requested. Generally speaking, the longer the charter trip you plan the more fish you'll catch and bring home with you. Also, don't forget the sunscreen! In the gulf, your targets would be King Mackerel, Cobia, Blackfin Tuna, Sharks, Red and Mingo Snapper, Grouper, Triggerfish, and more. Choctawhatchee Bay fishing options are Trout, Redfish, Black Snapper, Flounder, Bluefish and ladyfish. Fly fishing is also an option! Florida Boy Adventures is dedicated to providing you with the best Destin inshore fishing trip possible. Specializing in light tackle fishing for speckled trout, red fish, flounder, bluefish both, sheepshead and even Sharks on artificial and live bait. Offering 4 hour fishing trips and longer to suit your inshore desire! 1-3 Passengers - located in Santa Rosa Beach are east of Destin. All Fishing Gear is provided and fish cleaned! Destin Inshore & near shore fishing. Catering to the most experienced fishermen as well as novices. Destin Bow Fishing Charters for Stingrays. Cape Horn 22 Ft boat with Yamaha power with Cobia fishing tower. Specializing inshore, nearshore and flats fishing for all local species including cobia and tarpon trips! Provides fishing license, quality rods,reels & tackle. Licensed tournament winner with over 20 years local experience. Ever caught a Cobia from a kayak? Nows your chance! Tarpon, Cobia, Kings, big Bull Reds, Jack Crevalle! How about an offshore sailfish or tuna?! Captain Pat has over ten years of USCG licensed bay Destin fishing guide experience including bay, inshore flats, fly fishing, site fishing, and light tackle spin fishing…..all in the local waters of beautiful Destin, Florida. He invites you to join him on his 24 ft. center console bay flats fishing boat to create Florida fishing memories that will last a lifetime. Each Destin fishing trip includes bait, ice, fishing license, and only the best fishing tackle Shimano has to offer. The only thing you need to bring is your food, drinks, sunscreen and an appetite for Destin, Florida fishing fun! Live Oak Landing, an RVC Outdoor Destination and Captain Mark McDuffie of Wounded Warrior Fishing, offer professional guided fishing expeditions and tours of the Choctawhatchee river system near the Emerald Coast. Any guest to Live Oak Landing that is interested in receiving a guided fishing expedition or river tour can schedule an appointment with Mark. All equipment is provided and the tour boat can hold up to five people. Half or full day tours/expeditions are available. This is truly a world-class fishing experience because of Live Oak Landing’s unique geography that is surrounded by thousands of protected and undeveloped natural areas. Some of the species that inhabit these waters are Red Fish, Speckled Trout, Mullet, Red Snapper, Striped Bass, Bream, Shellcrackers, and Largemouth Bass. McDuffie grew up in the Walton County area, having decades of experience exploring the Gulf of Mexico and river system that runs to it. He has many local sponsors; some include Pathfinder Boats, Yamaha, Mann’s Bait Company and Quantum Reel and Rods. Inshore/Bay Destin fishing charters, specializing in light tackle inshore fishing in the Choctawhatchee Bay. Capt Brackin is a former marine fisheries biologist with 15 yrs experience fishing the bays & flats of the Florida panhandle. USCG licensed. Also, offer scalloping trips in St. Joe Bay in Port St. Joe from July - August and eco-tours of the lower Choctawhatchee River. All fishing and scalloping equipment provided! 4,6 and 8 hour trips. My trips are very kid friendly. Fish up to 4 people, ecotours up to 4 people & scallop trips up to 6. Fish out of Destin Harbor and Cessna Landing in Santa Rosa Beach.